Goals, Passion and Methods are the main themes that define my Newsletter of today. 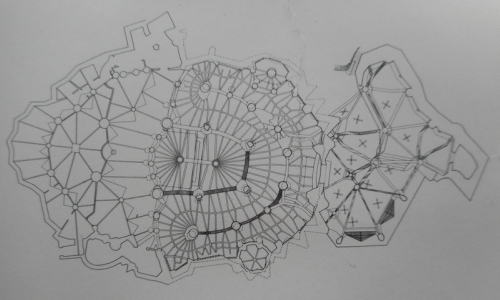 About the image above: Gaudi's plan of the Iglesia de la Colonia Guell, Barcelona (1898-1915). In 1876, Anna (Frank Lloyd Wrights' mother) visited the Centennial Exhibition in Philadelphia where she saw an exhibit of educational blocks created by Friedrich Wilhelm August Fröbel. The blocks, known as Froebel Gifts, were the foundation of his innovative kindergarten curriculum. Anna, a trained teacher, was excited by the program and bought a set with which young Wright spent much time playing. The blocks in the set were geometrically shaped and could be assembled in various combinations to form three-dimensional compositions. In his autobiography, Wright described the influence of these exercises on his approach to design: "For several years I sat at the little Kindergarten table-top… and played… with the cube, the sphere and the triangle—these smooth wooden maple blocks… All are in my fingers to this day… " Many of Wright's buildings are notable for their geometrical clarity. 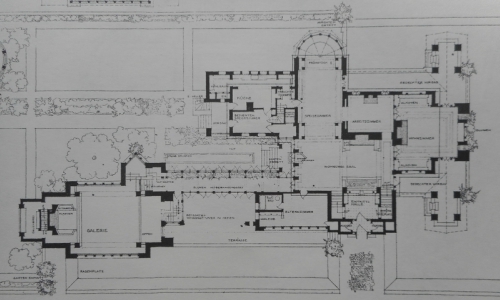 About the image below: Plan of the first floor of a city dwelling for Mrs. Susan L. Dana, Springfield. From Frank Lloyd Wright's early period (1893-1909). Anna, Frank Lloyd Wright's mother, had a passion: to see her son grow into becoming the most famous American architect. Her passion was so strong, that she found quite an ingenious method of instilling this grand idea into her son's subconscious: the "indirect" educational method of creating-while-playing. Her passion drove her to find the right tools at the right time: during his childhood. Passion, indeed, works in mysterious ways: it guides us to the right people/circumstances/tools. It is something magical. And, in the soul of her son, it worked wonders. As her young child grew up, his goal was set: to become an architect. How about his method? It was the "direct" way, not the traditional one (finishing his degree in architecture): he dropped school and started working as an apprentice. As Confucius said, he did not change his goal: he just adjusted his action steps. The rest of his amazing career, is known to the world. The above image marks the Fashion Design Section. I graduated from the Fashion Design school in 1993. In the summer after, I was looking for ways to experiment. So, my goal was: further development of my skills, especially in designing unusual patterns and using various materials. My method: since I did not have vast financial resources, I started using collage. I would photocopy interesting images (from books for designers), then use the cut-and-paste method to construct endless variants. It was easy, fast, and taught me a lot about a new way of solving problems. 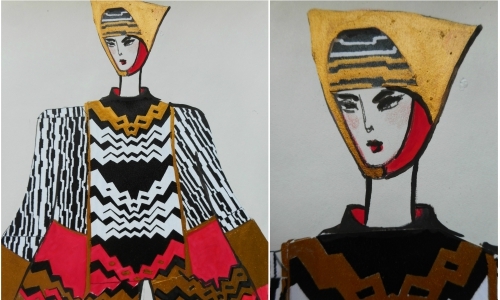 Needless to say, I was able to create a remarkable fashion design collection that summer. 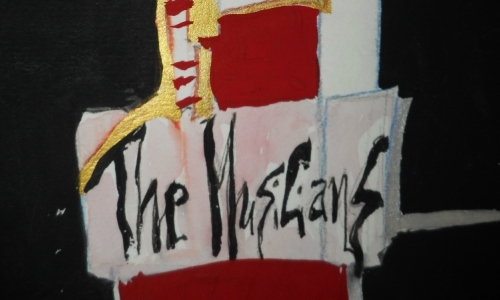 The image above, marking the Music Section, is a detail from one of my paintings under the title "The Musicians". What the story of Frank Lloyd Wright's mother (and her educational method) reminded me was my own teaching method, especially during my first experiences in Vienna. Almost immediately after receiving my Piano Teaching Certificate from the Conservatory of Vienna (this particular certificate being a requirement for teaching within Austria), I was given a class of students between 7 and 15 years old to teach piano. In Vienna, there exist more than 12 such Music Schools that are supervised by the Conservatory of the City of Vienna (now a University). Their function is to prepare students to enter the entirely professional environment of the Conservatory later (and only after passing the entrance examinations). What impressed me, right from the start, was the seriousness that was expected from these very young students. As a faculty member now, I witnessed the "entrance interviews" of these children. Of course, they did not have piano lessons before, yet they had to "pass" some entrance tests. From fingers coordination tests, to music hearing tests, the most striking one was the following: they were asked whether their parents took them out for the weekend. If they answered with a "yes", they were excluded! Meaning, they were expected to practice hard during all weekends. Talking about professionalism right from the start. I will elaborate on my own methods in the next issue. The image above marks the Painting Section: it is a detail from a work of mine, inspired by Paul Gauguin's "Visions After the Sermon" and carries the title PG-VATS-2. 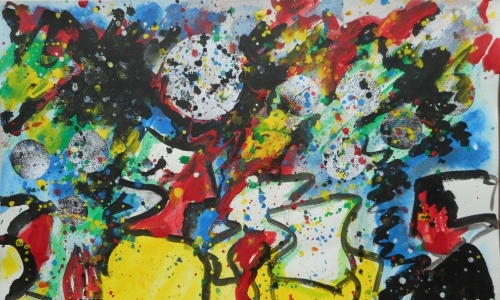 PG stands for his initials, and VATS for the initials of the title of his painting. Yes, you guessed it: the above image (a manuscript by J.S. 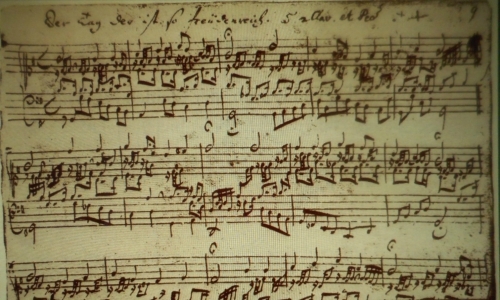 Bach) marks the Composition Section. Goals, passion and methods: where do all these fit in music composition? Well, to identify your goals here you have to be led by your real passion. There are numerous ways to compose nowadays, but almost all are (or should be) guided by your own passion. Is it Classical (New Music)? Is it more of an entertaining form? Film music? Whatever your passion is (and an honest introspection is needed here) will define your goals, thus leading you into finding the means to turn it into reality. Of course, as a trained Classical composer, I am more able to give some advice to my fellow composers: composing for film is not exactly my strength, however I had six semesters of electronic music. I can write a lot about the ways electronic composition has changed my whole attitude towards composing acoustical music. But, for now, I will repeat: listen to your true passion inside you. Let this passion guide you and allow it to define your goals. Never (I insist on that), really never, set your goals low. Aim for the starts for they will reward you! Classical music composition does not help any composer make a living: most of us aim for teaching positions. If you get lucky to be hired by a College or University, you already have found your patron. Though I have heard fellow composers complain about the pressure of teaching (and lack of time left for composing), let me just tell you this: yes, it is impossible to make a career as a piano soloist while teaching. Piano practicing is one of the most strenuous human activities. But, composing? If you have imagination and know your craft well, it should be a child's game. A talented composer should be able to create good works even by using a very limited amount of time (one or two hours per day): if not, then he/she was not meant to become a composer in the first place. That simple. And, how about Business? Today's suggestions fall perfectly in place by clicking on the link give above (at the Painting Section). Everything is there: goals, passion and methods as used by an artist making a living from the serenity of her own home. As a conclusion, do not forget: due to the upcoming festive season, I will have special offers just for my Newsletter subscribers! So, if you have enjoyed this issue, please spread the word! Let friends of yours take advantage of these special offers as well! About the promised discount code: we offer 40% some of our most beautiful products in an amazing variety. Just click on the link below (at the section "shop") and you will see what I mean!